Formula 1 racing is largely regarded as the most advanced and challenging form of motorsport in the world. The drivers are the best of the best and the teams spend millions, if not billions, on technological development and team operations every year. Every race season is made up of approximately 20 races, or grand prix, each taking place in a different country. Teams are allowed to compete with 2 cars at every grand prix. Each team produces their own chassis, but can buy their engines from another team or manufacturer. Teams that build both their own chassis and engines are referred to as factory teams. Those that build their chassis but buy their engines from another source are referred to as customer teams. 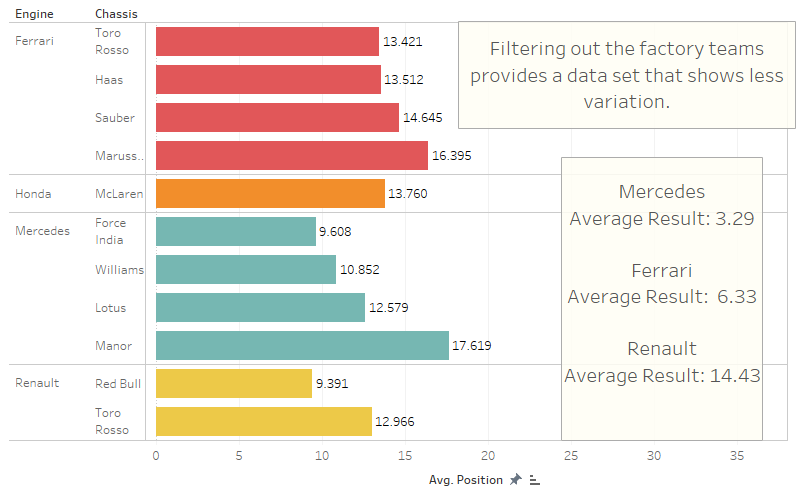 With so much money going through these teams, it is important to use data analysis and visualization to keep tabs on performance measures such as average finish and reliability. We chose to conduct our analysis from the point of view of a management group for a startup F1 team that is attempting to identify which engines to buy and chassis to base their design off of. The data shows that the factory teams of Ferrari and Mercedes have been dominant in recent years, but they do not represent a logical choice in our scenario due to their immense development budgets. Instead, we looked at the customer teams to guide our analysis. The measures we were concerned with included things like average finish and reliability as mentioned above, but also things like the difference between factory team performance and the performance of a factory team’s customer teams. After the analysis, we decided that the best engine package to choose in our scenario would be the one made by Renault. The optimal chassis to base our design off of would be the Red Bull. These options were chosen based on their individual performance, reliability, and relative performance to other teams utilizing the same engine packages. The data set we have gathered contains the results of each of the races run in 2015, 2016, and 2017 Formula 1 World Championship, complete with data such as driver, chassis, engine, finishing position, and reason for retirement (if the driver/car had to retire from the race). It also contains data on the year and location of each grand prix in order to find trends in performance from one race to another/one race season to another. Finally, it also includes the number of laps completed in each race, which can be used to determine reliability when referenced with the reason for retirement data. The report will walk you through the data analysis approach taken. The report will discuss the results the data presented and the methodology for concluding on the Renault engine and the Red Bull chassis to build a team that can compete with the factory teams. Identify correlation or trends between individual brands of engines and drivetrain packages to overall race performance and reliability. Making comparison between the main engine manufacturers and the chassis manufacturers based on the race results over the last three years of formula one racing. Early race retirements, racer performance and overall race laps completed are base measures for the comparisons. We aim to determine a specific engine manufacturer and chassis to build a new race team around in order to compete with the larger and successful factory teams. The first and most obvious way to address the race results were to plot the engine and chassis team result against each other. Please see the following plots of Average Finish for Engine, Average Finish for Chassis, and Average Finish for Engine and Chassis. These visuals can be filtered to individual years. This allowed us to look at team performance trends, or the absence of trends, through individual years or time frames. Tracking these results through years of race results there were common dominating teams that appeared. 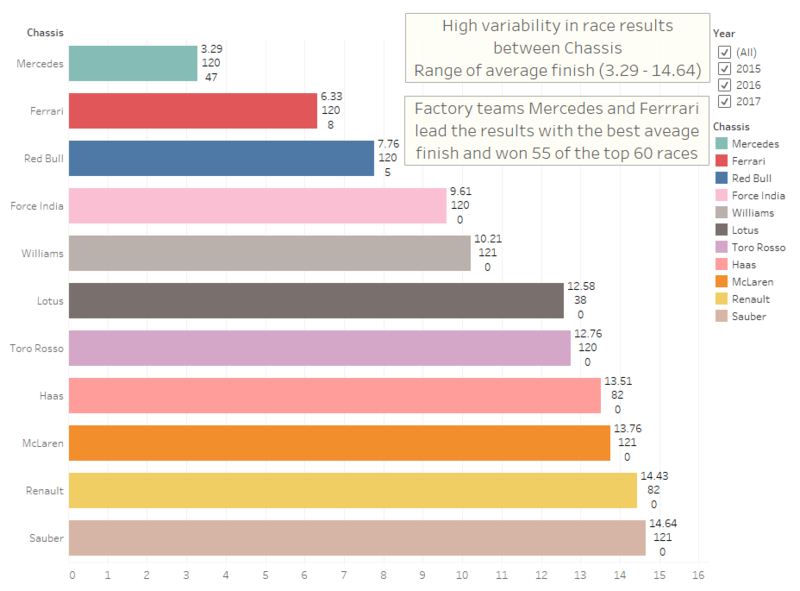 Factory teams of Mercedes and Ferrari dominated with the lowest average finish and 55 of the 60 victories being claimed by the two respected teams. Since our objective is to identify alternative engines and chassis to compete with these dominating teams we decided to look further into the non-factory teams. With this objective we decided to filter out the factory teams of Mercedes and Ferrari along with the winning results of Red Bull for next data plots. We also believe this can relieve some of the skewed data and allow for more consistent comparisons. The source of the skewness in the data could be from the skill level of the winning or top drivers, or the greater support given to the factory teams. These plot points out some area for optimism and some areas of concern for our objective. The Engines of Renault and Mercedes had very good results, when you look beyond the Manor chassis. In fact the results of these two teams besides the Manor chassis has greater results than the Renault factory team of 14.43 average finish, and give the results closest to Ferrari and Mercedes. So identifying Force India, Red Bull, and Williams as possible Engine and chassis pairing we next wanted to verify that the overall reliability of these engines and chassis. This reliability analysis is also important as it may be a source of poor performance, or an answer to the deviation between factory and customer teams. We wanted to verify that the reliability of the equipment was not the source of the variation between the race teams. So to analyze the reliability of the engine manufacturers, the following plot looks at the total count of early retirements from assignable causes pertaining to the engine. This includes the battery, engine, ERS, fire, fuel injection, and many other engine failures. 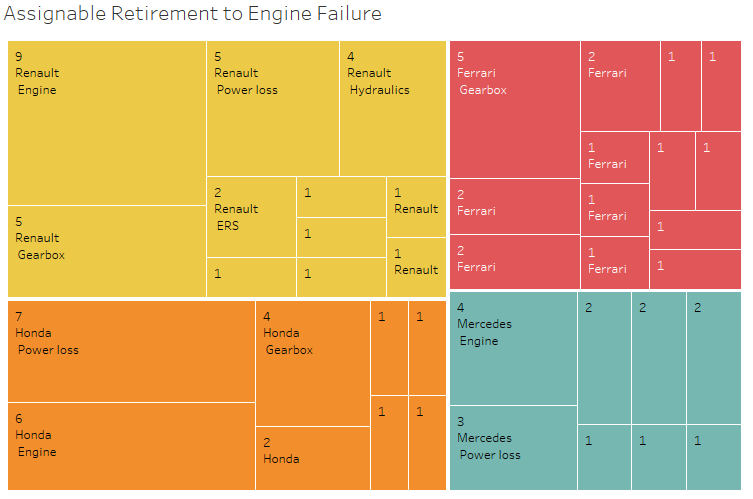 Comparing the total number of early retirements by engines, Mercedes has the slight edge with the fewest. Renault has the greatest, including a high of nine engine failures. Gearbox failure and power loss appeared to occur regularly for all engines. In conclusion from this analysis, Renault engines hold a slightly higher risk of assignable retirement to engine related failures. The total number of early retirements for the specific engine teams are as follows: Renault (31), Honda (23), Ferrari (20), and Mercedes (16). Now looking further into the chassis manufacturers we compared the assignable retirements in the same manor. The causes for early retirement assignable to the chassis failures were suspension, brakes, hydraulics and many other chassis malfunctions. 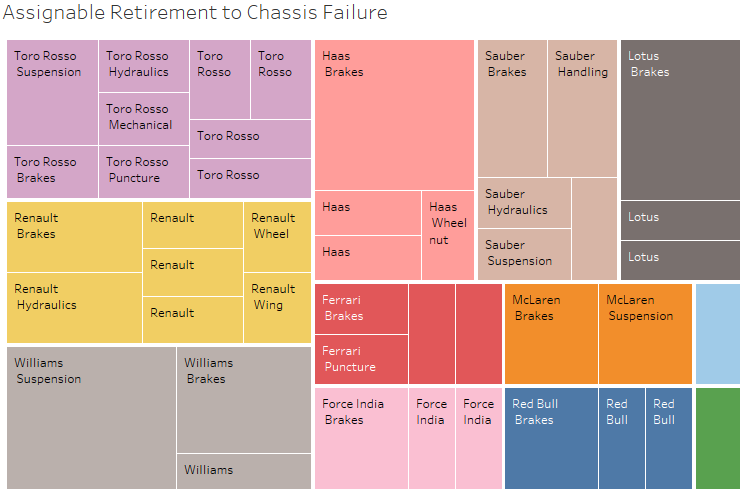 The manufacturers with the greatest number of retirements were Toro Rosso, Renault, and Williams all tied with nine incidence. Once again there were not teams that showed significantly greater quantity of one particular failure. In fact, there were many customer teams with very few failures like Manor and Marussia while the factory team of Renault has many early retirements. This leads us to believe that there is not enough evidence to rule out specific teams for being unreliable. We also wanted to look at the average variation for engines across different chassis. 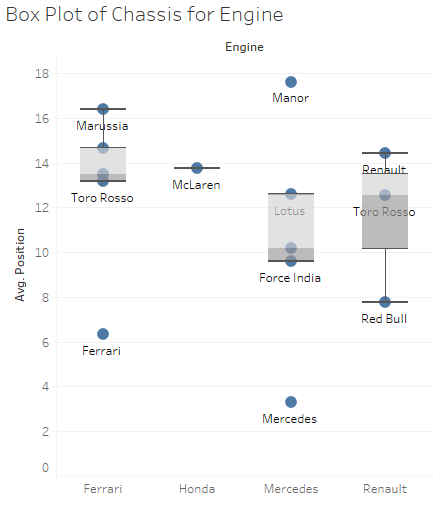 The box plot offered a quality visual of the range in performance of the engines across the chassis teams. This proved to be a very interesting result. The dominating factory team of Mercedes has the largest range of average performance. There is also a very large drop off between both the Ferrari and Mercedes factory teams’ performance and their customer team performance. This is an undesired effect, showing that the engine manufacturers may give poor support to their customer teams. When you look at the Renault Engines you can see that the customer teams of Toro Rosso and Red Bull actually perform better than the Renault factory team. This characteristic is what we are looking for in the analysis and new teams entering formula one racing, wanting to compete with the factory teams would desire. 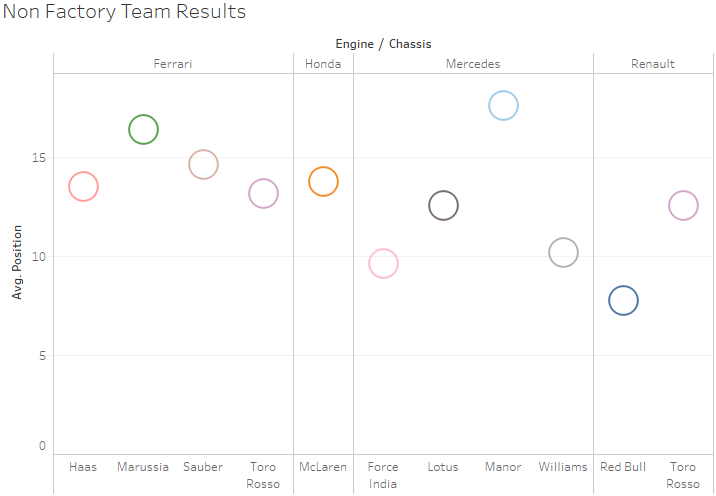 The final data we analyzed was the performance of the teams at specific prix. As expected there was trends of teams performing well at specific races throughout the years and struggling at other races. This can be seen the plot Grand Prix Results. This would be very important if new teams wanted to perform better or weight certain competitions as more important than others. They could potentially predict greater result for specific races back to their engine and chassis manufacturer. Through the data analysis we have concluded that the optimal engine and chassis package to build a new formula one race team is Renault for engines and Red Bull for chassis. The decision to choose Renault engines was made largely due to their high performance in the hands of customer teams and the small performance spread amongst the Renault engine teams. This means that there is higher communication and support between the customer teams and Renault. It also means that there is less emphasis on factory team performance and more on the performance of every Renault engine in the field, regardless of team. The Renault engine package was shown to be the least reliable of all the engine packages, however in the 360 opportunities (6 cars with Renault engines X 60 grand prix) for failure in our dataset, there was only 31 total retirements due to engine issues for Renault. We decided that the performance benefits outweigh the risk for engine failure for a startup team that simply needs to perform well in a couple of races in order to secure sponsorship money. We also decided to select the Red Bull chassis for our figurative startup F1 team. Again, this is largely due to its high performance coupled with an equally high degree of reliability. This chassis is a proven performer with the best average finish of any customer team over the 3 years of competition in our dataset. The next highest performing customer team is Force India with an average finish of 9.61. The Red Bull chassis has an average finish that is almost 2 full positions better, with 7.76. Moreover, the Red Bull is the only customer team chassis that has won a Grand Prix in the last 3 seasons; in fact they have 5 wins. Along with its high performance, the Red Bull is also an extremely reliable chassis. In total, there were only 4 failures experienced by a Red Bull chassis in 360 opportunities. This reliability is only matched or beaten by teams who did not run all 3 seasons in our dataset or experienced so many engine failures that they did not have as many opportunities for chassis failures. This reliability coupled with race winning performance made the Red Bull chassis an easy choice. I found your very first graphic to be interesting. The “premier” consumer car brands such as mercedes and ferrari, get outperformed by more common car brand companies such as honda. It shows that honda is capable of competing with the “premier” brands, it just does not fit into their business plan and strategy to selling consumer cars. Either that, or they have more money and can sponsor a lot more drivers than the other companies, increasing their chances of high finishes. Thank you for sharing your analysis. I was not very familiar with this type of motorsport prior to reading this posting but the objectives seem important for the team’s future designs. I think it was important that you removed some of the top performing teams to avoid skewness. I liked that box plots were used to analyze the variation of the engines. It was interesting to see that the largest range of average performance was from Mercedes. I think you’re viewpoint as part of the management group for a startup formula 1 team is really interesting. Clearly your analyses showed that Mercedes and Ferrari are better performing engines, chasis, and overall F1 cars, but as factory teams, they’re out of scope for your startup team. What I wondered when reading this report is why Ferrari and Mercedes are so much better performing than other teams. And on top of that, Mercedes seems to be head an shoulders above Ferrari. Analyzing why that’s the case could help a startup formula 1 team. Thank you for sharing your work. I had no previous knowledge of formula one car performance prior to this. It was interesting to see how you accounted for certain engines avg finish being helped by the performance of factory teams. An graphic that could be cool to see would be one that ties the cost back into avg finish position to see which engine would give you the most “bang for your buck”. Thank you for sharing the work. I am a big fan of Formula One and have seen the reliability issues the Renault team has been facing with their engines and chassis for the past two years of Grand Prix and your data analysis seem to address these issues right to the core. After completing the reading, I now feel like I have all the tools necessary to purchase and start my own formula one team. I was very interesting to see how companies like Renault did not only focus on their own factory team but also their customer teams. They seem to be more concerned with holistic performance then companies like Mercedes-Benz and Ferrari. I think it would be intriguing to see the same research apply to other forms of motorsport (or NASCAR). The thing that I noticed was the point of ignoring the driver. The cars are all supposed to meet a minimum specification so that the cars are close to equal. The reason that Ferrari and Mercedes win so often may be because they have the money to pay the best drivers. All the customer teams may have the same motor and chassis or the equivalent but cannot hire the best driver because they do not have the deep pockets the other two have. They may all place similarly because they all have about the same budget and hire equal drivers. What I am getting at is the placement for Renault might not be because of the engine and chassis but because of the drivers.